In recent years, occupational health (OH) practitioners will have come across the concept of ‘flags’ in helping employees return to work after sickness absence, but there is still some confusion about how flags are used in practice. This article aims to help clarify the place of one category – psychosocial flags – in the rehabilitation process, and how flag assessment can be used in an OH adviser’s clinical work. Flags are used in a variety of contexts in everyday life, but nearly always to give us information or an indication – the Queen is at home, you’re on the final lap, or you have arrived in another country. Flags in health are used in much the same way – to inform and alert us to something about a person or their problem that requires closer study. Clinical flags are common to many areas of health – for example, red flags for musculoskeletal disorders, which are indicators of possible serious pathology such as inflammatory or neurological conditions, structural musculoskeletal damage or disorders, circulatory problems, suspected infections, tumours or systemic disease. If suspected, these require urgent further investigation and often surgical referral. There are certain signs and symptoms that when observed in a patient’s examination or history alert us to the fact that something could be seriously wrong.1 In the case of musculoskeletal disorders, physiotherapists are highly trained to identify or rule out red flags. Psychosocial flags allow us to identify aspects of the person, their problem and their social context, and how those factors affect the recovery and return-to-work process. The concept was introduced in 1997 by Kendall et al3 and looked at factors that identified patients who were at risk of developing chronic disability, and did not recover as was expected for their condition. There is much more in-depth information about flags in the Tackling Musculoskeletal Problems – a Guide for Clinic and Workplace – Identifying Obstacles Using the Psychosocial Flags Framework document, available from the Stationery Office at www.tsoshop.co.uk/flags. Pink flags are unofficial, but they are included in this list because they can be useful in practice, although as yet there has been little research to provide an evidence base. These were described by pain specialist physiotherapist Louis Gifford in 20055 to reflect his concern at the constant focus of medicine on the things that make people worse, rather than looking for factors that can help make people better. The psychosocial factors that are focused on are those that promote a poor outcome, so we should look for attitudes or ideas that promote a good outcome as well. Pink flags are positive factors that we should look out for and emphasise, and even try to help create, that give people the chance of a better outcome. Examples would be someone who enjoys their job and is keen to work with the team to find a way back to work, and an employee who has discovered that activity actually helps them feel better, so wants to stay active at home and at work. 1. Observation – of the way the employee behaves, interacts with others, and talks about their condition and work. Other questionnaires exist for measurement of fear avoidance, fear of movement and self-efficacy, and may be a useful addition where indicated. 5. A visit to the workplace – an excellent additional method of assessing flags. Whether an informal visit or a more structured one for ergonomic assessment, a wealth of information can be gathered when you are familiar with the flags system and what to look out for. The results of your assessments equip you with the tools to put together a suitable plan for rehabilitation with the employee and the other stakeholders in the process. Dealing with the psychosocial findings will result in better functional outcomes for the employee. The presence of psychosocial flags should never be a reason to exclude people from treatment programmes or rehabilitation, or to write them off as people who will not recover, but to give them every opportunity to recover through the provision of suitable support. Depending on the flags that have been identified, a number of different stakeholders and professionals will need to be involved in the action plan to overcome the obstacles and return someone to work. It may be necessary to make referrals for health treatment, undertake medical investigations, organise case meetings with the workplace, and arrange advice from external support agencies, such as debt counselling. Your professional role will dictate to some extent the obstacles that you can assist with on your own, and which areas you need help with. Reassure and educate the patient about the biomedical aspect of their problem, and the fears and concerns they may have about the future. Include the employee in the planning process. Advise appropriate healthcare intervention/treatment where indicated, which can be applied alongside workplace rehabilitation plans and facilitate an early return to work. Communicate to all the stakeholders – employee, employer, healthcare, family, external agencies (debt, housing advice as relevant) with shared goals and focus, and identify who is responsible for each part of the rehabilitation ­programme. Support workplace co-operation and assistance in providing suitable duties, hours and support to enable the employee to return to work. Although the flags system can seem like a minefield to begin with, it is an effective and straightforward way of identifying and assessing obstacles to recovery for your clients. Once you are familiar with the different classifications, you will become more adept at spotting flags easily in conversations, and asking more questions when a seemingly little flag persistently waves at you. Over time, flags become a natural part of your assessment process, and integrated into your return-to-work planning. Much of the material for this article is based on the updated information in the document developed by the Flags Think Tank book written by Nicholas Kendall and Kim Burton in 2009, published by the The Stationery Office (TSO) (ISBN 978-0-11-703789-2). It is recommended reading for more in-depth information about using the psychosocial flags framework. There is also an increasing number of free downloadable resources available linked to the book, including leaflets for employees, employers and health professionals, and speaking notes with Powerpoint presentation slides (www.tsoshop.co.uk/flags). 2 Main, C.J., Philips, C.J., & Watson, P.J. 2005 Secondary prevention in healthcare and occupational settings in musculoskeletal conditions (focusing on low back pain) in Handbook of complex occupational disability claims: Early risk identification, intervention and prevention. I Z Schultz & R J Gatchel, (eds) Springer Science & Business Media, New York. 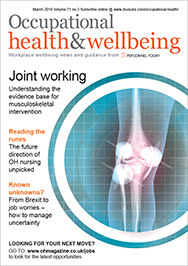 4 Kendall, N & Burton K. 2009 Tackling musculoskeletal problems – a guide for the clinic and workplace. The Stationery Office. 7 Linton, S.J. & Hallden, K. 1997 Risk Factors and the natural course of acute and recurrent musculoskeletal pain: developing a screening instrument. Proceedings of the 8th World Congress on Pain. 10 Waddell, G. & Burton, K. 2004 Concepts of rehabilitation for the management of common health problems. The Stationery Office. 11 Shaw, W.S., van der Windt, D. A, Main, C.J., Loisel, P., Linton, S.J., Decade of the Flags Working Group. 2008. Early patient screening and intervention to address individual level Occupational Factors (“Blue Flags”) in Back Disability. J Occ Rehab. Published online 12/12/08. Springer Science & Business Media. LLC 2008.